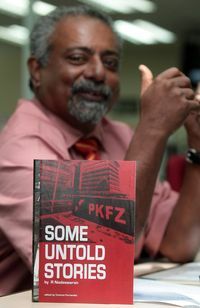 Malaysiakini : I attended summer courses at the Centre of Investigative Journalism at London’s City University and obtained a law degree at the ripe age of 47! We attended the “University of Hard Knocks” and came out with flying colours. Call it hunch, intuition or instinct. With our experience and knowledge, we can spot a fib almost immediately after it is uttered - that is, if we are monitoring a particular issue. I read, re-read and digested former premier Najib Razak’s interview he had given to Reuters. Najib said he would have acted if he knew 1MDB funds were being misappropriated. Really? Utter bunkum! For more than four years, right-minded Malaysians were telling him about the nonsense that was going on, his involvement and events taking place under his nose. In a way, Najib is right about ‘acting’ - he got rid of the Malaysian Anti-Corruption Commission chief Abu Kassim Mohamed and the attorney-general Abdul Gani Patail. Their investigations revealed too much. The heat was too much to bear. Najib will be aware that ordinary mortals like us are queried by banks and other enforcement authorities even if just RM20,000 is deposited in our accounts. How come Najib was never queried and charged under the Money Laundering Act when RM2.6 billion was clandestinely deposited in his personal account? Providing flimsy reasons and hiding behind officialdom after the transactions are of no help. The other issues raised in the interview deserve another column but, in the meantime, let me get colloquial – stop hiding the pumpkin, cut the bull****, tell the truth and shame the devil.